MoonMarble.com - Glass Eye Studio Egg Weight - "Blue Carousel"
Art Glass → Glass Paperweights & Decor → Glass Eye Studio Egg Weight - "Blue Carousel"
This egg shaped paper weight was handmade by artists at the Glass Eye Studio. Made with recycled glass that contains ash from the 1980 Mt St. Helens eruption. 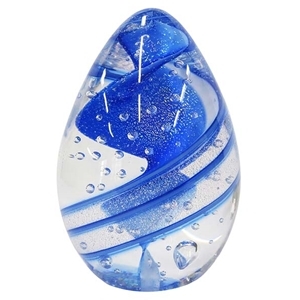 Celebrate Spring and all creation of life with this blue dichroic spiraling design. Approximately 2 1/2" tall by 1 5/8" wide. This is a hand crafted item and may vary slightly from the photo.